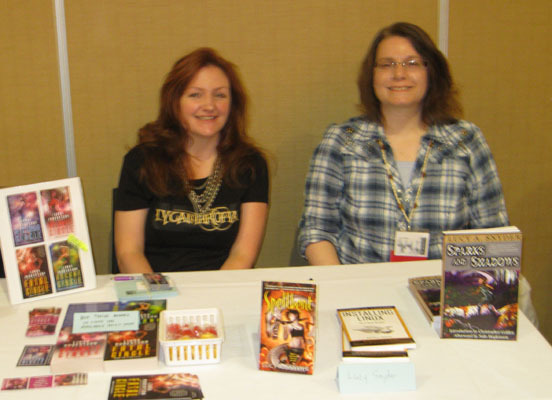 Also got to hang out with some established friends--on the left is DeniseVerrico with her book CARA MIA, book one of the Immortyl Revolution series. She has a background in theater, aint' that cool? In the middle is S. A. Swann with a variety of his books (BTW he's won some major awards and has impressive nominations--you should be reading his work! ), and James O. Barnes is on the right with THEIF KING. He's an author, a publisher, and teacher. And lastly here's me in the Lycanthropia shirt some fans made and gave me at the Romantic Times Convention. It's my new standard book-signing shirt. :-) And I had the honor of sitting with Lucy Snyder, another award winner. (http://www.lucysnyder.com/) I recently finished her Urban Fantasy Spellbent and it was gritty, fast-paced, and full of little quirky details that are highly entertaining but also grounded the story (for me anyway--I have kids and dogs--so unexpected goofy things are commonplace). I also met Cat, J.M., Trista and Dan, Greg, and so many people who's names I sadly don't remember!! Thank you to everyone who had books for me to sign (squee! ), thanks to all the Context organizers, especially Nick and Linda Winks, and on a personal note, my tongue-tied nervousness with public speaking does not yet seem to be abating. I'm fine if I'm not in front of the room behind a table. So if you see me at a con and I seem like a nit-wit on a panel, come up and talk to me when I'm not behind the table. I'm still a goof, but I'm not as likely to stutter.